In the 1970s, 5178 stone fragments dating from the eleventh to eighth centuries BC, representing archers, boxers, warriors and nuraghe models, were excavated by the Archaeological Superintendence of Cagliari (Sardinia) from the funerary and sacred area of Monte Prama, near Cabras, Oristano. 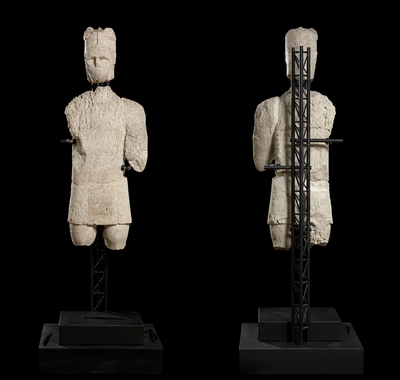 The statues are known today as the Giants of Monte Prama, due to their impressive dimensions, more than two meters in height. The monumental statues shed new light on the art and culture of the Sardinian people. In 2007 the CCA, Centro di Conservazione Archeologica of Rome, directed by Roberto Nardi, was awarded a contract to design and implement a conservation project to put the statues on display at the Museum. The funds (1,128,909 Euro) were made available in the framework of a Program Agreement for Cultural Heritage between the Ministry of Culture of Italy and the Autonomous Region of Sardinia. The work was carried out in the 450 square meter laboratory of “Li Punti”, made available by the Superintendence in Sassari, set up by CCA for this purpose as a space open to the public. Technical interventions performed during the conservation process were designed according to the principles of minimum intervention and reversibility, respect for the original materials and finish, for the patinas of time and the marks of history, full documentation and complete transparency. The curative conservation was carried out by using delicate systems for cleaning - atomized water and mechanical tools, compatible material for consolidation and surface protection – lime based mortars, gluing and external metal supports for remounting the fragments into statues. No holes have been put into the original stone to insert pins. The fragments, their state of conservation, the technical original details, the operations implemented have been documented graphically, on a database, with photos and video, with a 3D scanning campaign that covered the entire collection. Diagnostics provided study tools and techniques to identify the problems regarding the deterioration of the artifacts, their interaction with their surroundings, and the stratifications, documenting the ancient and recent history of the sculptures. Cleaning, consolidation, re-composition of the matching fragments, gluing, assembly of the statues and creation of new supports for museum display are some of the activities implemented, and represent only a small percentage of the activities carried out during the program. 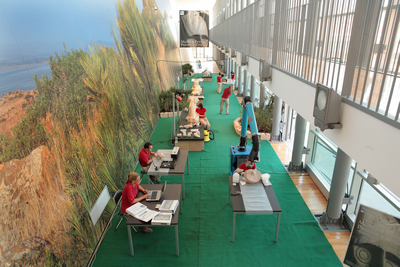 The Monte Prama conservation project was designed as a multidisciplinary effort to bring together aspects of conservation and restoration, public engagement and communication on regional, national and international levels in order to fill the chasm that centuries of neglect have created between the statues and the public. For this purpose the program was strongly geared towards public involvement. Information was disseminated among the wider public by opening the restoration workshop to visitors and through other initiatives. Longer-term objectives were to make students, academics and the public more familiar with the artifacts and bring the statues back into daily life, the island’s culture, and international knowledge. The traditional restoration workshop has been transformed into a Gallery Laboratory where the public can observe the progress of conservation and restoration activities. Initiatives for students have included a poster contest for primary, middle and high school pupils, as well as guided tours to the work site. Specifically designed didactic materials have focused on the meaning of this unique archaeological legacy and on the importance of preserving historical and artistic evidence for future generations. Press conferences, public meetings, conferences and a web site dedicated to the Monte Parma project are some of the other initiatives carried out to keep the local population and the general public constantly updated on the progress of conservation and restoration activities. Due to the high number of fragments of all sizes and weights, the fragile composition of the original stone (a bio limestone), and the lack of any information on the statues and their original shape, the project’s initial objectives were limited to the study and accurate documentation of all the fragments, their consolidation and stabilization, and the reconstruction and display of one or maximum two sculptures. At the end of the project the results were 1202 fragments assembled out of the original 5178 fragments, 38 sculptures mounted on new supports, forming an impressive army of five archers, four warriors, 16 boxers and 13 nuraghe models (cone-shaped stone towers). In Spring 2014 CCA put the collection on a temporary display in the National Archaeological Museum of Cagliari and Museum of Cabras. At the same time funds have been allocated for the reorganization of the Museum of Cabras to host the collection close to the original site of Mont’e Prama. The Monte Prama Conservation Program has been a cultural, technical, and financial challenge that allowed a unique, forgotten page of history to return to the knowledge of specialists and of the wider public. Thanks to accurate study and technical analysis, much information was gathered on aspects almost unknown in relation to the Nuragic civilization and published in three volumes. Amongst the several economical outcomes of this project for the Island, the number of tickets to the Museum of Cagliari sold have doubled, and increased fivefold at the museum of Cabras; new restaurants and hotels opened in Cabras; new souvenir production started; new wines were produced in the name of the sculptures. From a cultural angle it is worthwhile to report that when you land in Sardinian airports, representations of the sculptures welcome you, schools organize activities related to them, festivals are organized using the sculptures as logos, the regional basket ball team adopted the sculptures on their t-shirts, many international broadcasts report about the collection and, recently, after receiving the Prize of the Jury at the Europa Nostra Award 2015, the Regione Sardinia managed a successful voting campaign for the Europa Nostra Public Choice Prize. The sculptures of Monte Prama have been received by the local population as a major component of their cultural heritage and they are becoming “the brand” of the Island. The project was a multidisciplinary effort aiming to bring together conservation, museology, public engagement, community involvement and communication on a regional, national and international level. The success of this project brought-in new resources and a new excavation was organized in 2015 giving as result 2200 new fragments, 4 new sculptures with 2 new typology. A new conservation project started in the museum of Cabras with the common objective to complete the conservation of 7500 fragments of stone and put the collection in display ia a new museum in Cabras, close to the original site where the sculptures were discovered forthy years ago.